The secret visitors at night, or just the shy one's! 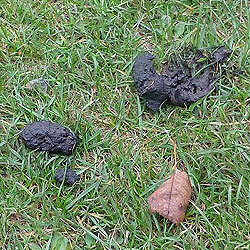 In rural area's droppings are usually a very dark almost black colour and all too often found in the middle of your lawn. In urban area's, due to them eating more un-natural foods such as human cooking waste they will be lighter in colour. They are quite soft in texture, somewhat slimy looking, often with a curl just to finish things off! 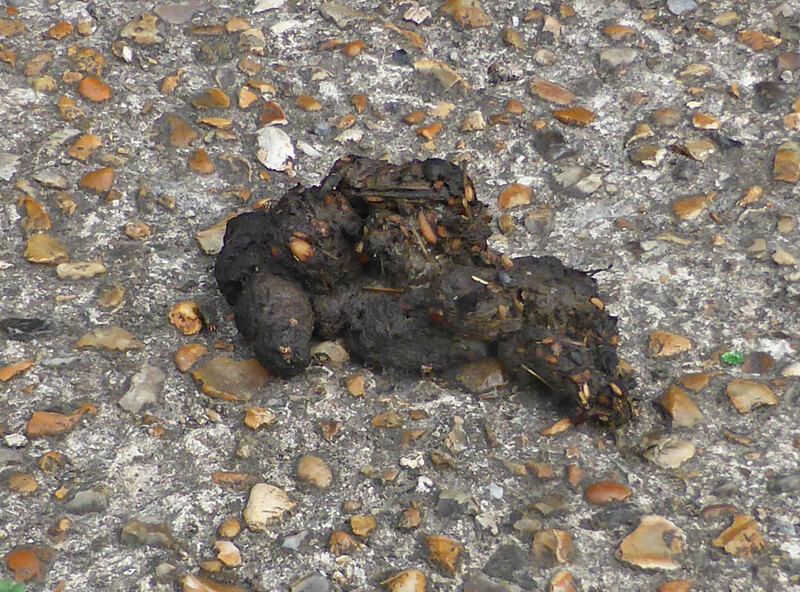 About the same size as Dog droppings, digging around you may find bits of fur, bone or feathers. 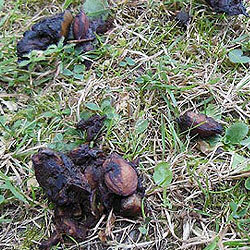 Droppings can vary depending on what Badgers have been eating. 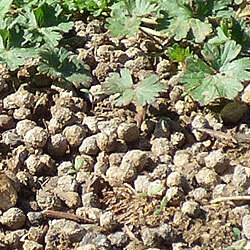 The photograph shows that this Badger had been under the Walnut Tree. Had he or she been eating mainly fruit and worms, this could be lighter in colour and quite soft. You will often find scraping next to the heap. 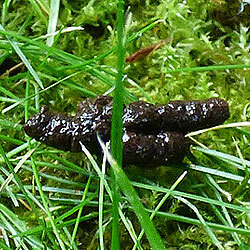 Badgers use their droppings to mark their territory. 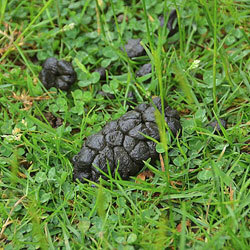 Droppings will often be found on grass close to either a flower border or hedge. Mostly they are a very shiny black colour and up to about 5cms long. Looking closely you may discover bits of insect or not properly digested worms. If you think you have hedgehogs in the garden and they're a bit elusive to you, try putting two bowls of Meat Cat Food some 10 meters apart and if it's gone by morning, look between them. See the Hedgehogs in the Garden pages for further information. Lovely to watch but not so lovely if you have a growing Vegetable Garden! Rabbits leave clusters of bullet type droppings, light in colour and quite hard. An easier way to describe them should your kids want to join in the search is, they're a bit like Cocoa Pops but lighter! They will also produce undigested food, fairly soft. Usually they will re-digest these to gain nutrients. 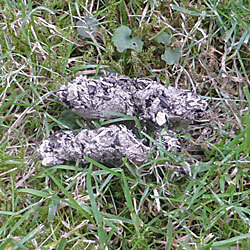 Hare droppings are usually slightly bigger and of a flatter shape. Rat droppings can be a real nuisance, especially if you keep say Chicken Feed anywhere. Rats and Mice will drop 50 - 70 'pellets' a day, so if you have a few families living somewhere outside, that's quite a bit laying around. 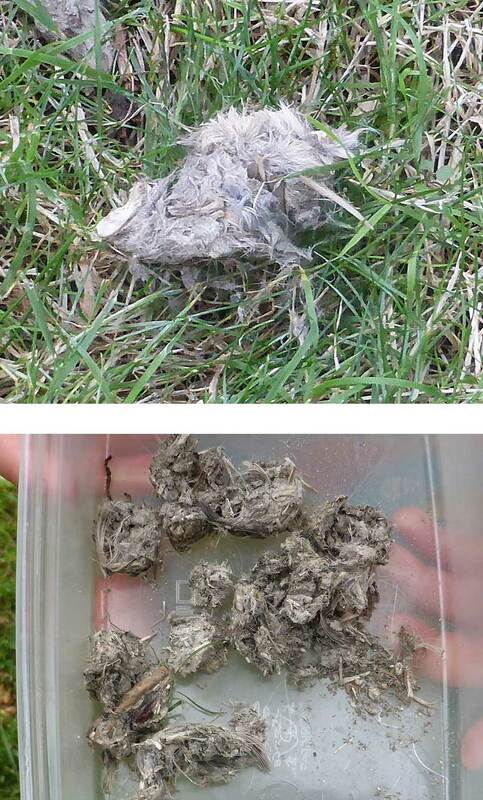 Unlike many creatures they will not drop in one place, Rats more 'poo as you go' so spread out over biggish areas. 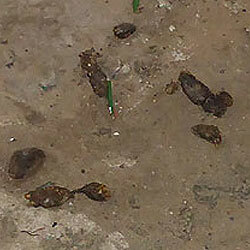 Mice droppings are very similar but smaller than those of a Rat. Any droppings from any wild creature can obviously carry diseases which could affect humans and / or Pets, so a good morning check and clean up is always wise, especially if you have Children. 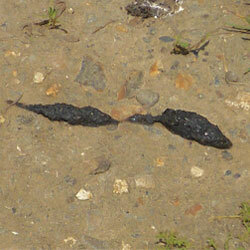 Weasels and Stoats being quite similar creatures have droppings fairly similar to each other. The photograph left is that from a Weasel in my Garden. The only real way to determine which of the two it is, is either by actually seeing one visit your garden, or by the size of the dropping, the Stoat being larger and thicker. Both creatures mainly feed off small rodents but will also hunt Rabbits and Birds. Deer droppings are either in clusters stuck together or in individual pieces, a bit like a Rabbit but much darker and shiny. They seem not to have preferred areas and will drop almost anywhere, on your grass or concreted areas. Footnote; In the light of a few instances where people have contracted Limes Disease from infected Deer Ticks, it is advisable not to physically approach Deer too closely. I should add this is quite rare. OK., Owls are not animals as such but being not the normal visual appearance of birds, they can be mistaken for four legged creature. Their droppings are a white slippery liquid and found underneath where they perch.